So, I missed to celebrate Diwali with family one more year. This is the 4th consecutive year and it's no more fun missing family on festivals. To compensate that, I made some busy plans for this weekend like cleaning, cooking, dressing up, meeting friends with whom I got a chance to lit a sparkle that made me happy of diwali, games, good food, lots of sweets, loads of pictures and then watch Captain Phillips. Of all, cleaning was the worst part. CP is one of the best action and thriller movies I have watched recently. Expecting it to be little boring from the poster, I still wanted to watch seeing the reviews. It being the true life story with many twists and turns made it more watchable. This is the story of a Captain of a huge American cargo ship that has to be reached to Africa from Oman. 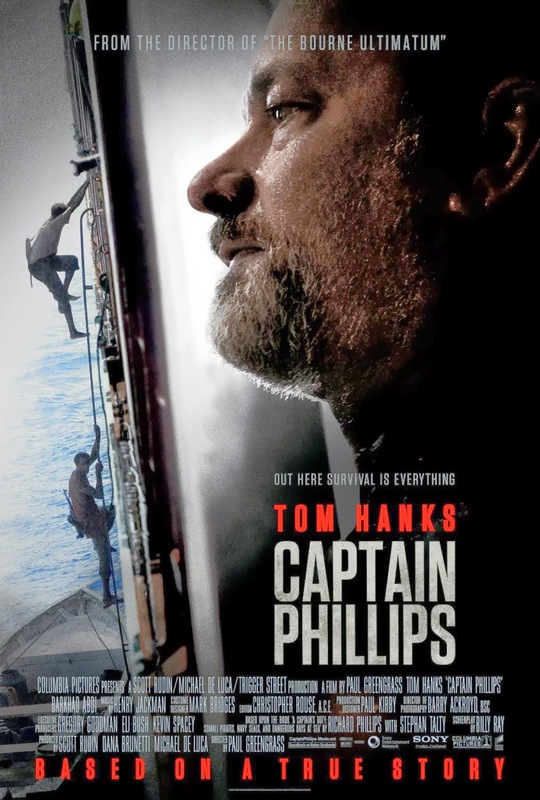 Tom Hanks played it the best by being the captain who tries to save the ship and his crew while they are being hijacked by pirates while passing through Somalia. The whole story is on water and I loved all the water sequences and the chasing scenes of the pirates boat. You get to see the security they have on such huge ships. Didn't expect them to be so unarmed. What if they have been attacked like this from nowhere in the middle of a sea and no emergency comes on time for help. I would think they must have had appropriate and much more security except just the splashing water from the cargo which doesn't stop the pirates to get onboard. The leader of the Somalian pirates played well too. He is funny at how he keeps calling the captain as 'Irish' and his dialogs with him. And he is scary at the same time. He being the only smart (he gets to know how smart he is at the end) in the team makes them not to leave with just the money the captain offers them. All that they needed/need is more money. I still wonder if the situation in Somalia is always like that. The story is more thrilling when the pirate gets caught by the crew and the leader promises to release the captain in exchange to the pirate but kidnaps him instead still to get more money. It's here the story excites the audience when the pirates leader is reluctant to leave the hostage even after several warnings and how the navy force acts to help the captain. I would like to leave the story here for you to go and watch the movie. What's the thrill if you read everything here and then go/no-go to watch it. I would definately say it's a must watch for ones who love action+thrillers. I would also love to read the book 'The Captain's Duty' which this story is based on. Looks like many of the aspects from real life are changed/ignored in the movie and vice-versa. Yeah, I loved every bit of it.